The Nile has intrigued man’s imagination more than any other river in the world. Unrivaled in length in the African continent, the great river is 4145 miles long flowing from beyond Lake Victoria, through more than half the length of Africa, to empty its water in the Mediterranean Sea. During its flow, it twists across dense jungles, haunts of big game, past the mysterious buildings and stone faces of ancient Pharaohs who forged the great civilization of Egypt before joining the sea. On its way, it receives many smaller rivers, the two most important being the Blue Nile and the Atbara or Black Nile. Not until a century ago, did men probe farther for the river’s beginning. Notable among them are the names of Dr. David Livingstone, John Hanning Speke, Richard Francis Burton, Samuel Baker, and Henry Morton Stanley that stand out among the greatest figures of the nineteenth century explorers of Africa, who tried to search for the origin of the River Nile. It was not until 1937, when an obscure German explorer by name Dr. Burkhart Waldecker ended the search and traced the river’s southernmost source to a tiny spring that bubbled out on a lonely summit in Burundi. It was the humble birthplace of the majestic River Nile. For millenniums, the wisest men of the Egyptian civilization have been mystified by the Nile’s annual flood, which watered and enriched its valley, sustaining generations of Egyptians and Sudanese in an otherwise arid land. According to Al-Maqrizi, the fifteenth century Arab historian, when the Arabs conquered Egypt, Amr ibn al Aas (r.a) the Arab general leading the Muslim army was told that the Egyptians were accustomed at the period when the Nile began to rise to deck a young virgin in gay apparel and throw her into the river as a sacrifice to gods in order to obtain a plentiful supply of water to irrigate their crops. The Arabs soon abolished this barbarous custom; and the Nile in consequence, did not rise in the least degree during the space of nearly three months after the usual period of the commencement of its floods. As a result, the Egyptians became greatly alarmed and approached Amr ibn al Aas who was now the Governor of Egypt for advice thinking that a famine would certainly ensue for not carrying out the age-old sacrifice. It is reported that Amr ibn al-Aas wrote to Khalifa Umar to inform him what he had done and of the calamity with which Egypt was threatened, seeking his counsel in this matter. Umar ibn al-Khattab (r.a) returned a brief answer expressing his appreciation of Amr’s conduct and desiring him upon the receipt of his letter, to throw a note, which it enclosed, into the Nile. The text of the note ran as follows: From Abdullah Umar, Commander of the Faithful, to the Nile of Egypt. “If thou flow of thine own accord, flow not: but if it is Allah, the One God, the Mighty, who causeth thee to flow, we implore God, the One and the Mighty to make thee flow.” Amr did as he was commanded; and it is recorded that the Nile, rose sixteen cubits in the following night. The British scientists examining this phenomenon of flooding in the late nineteenth century soon found out that it was the Blue Nile and the Atbara, which were mainly responsible for the yearly floods. The main river collected an enormous amount of water from the great equatorial region around Albert and Victoria Lakes, which passed through a marshy district where a great deal was lost. Added to this, the terrific heat in Upper Sudan caused a high percentage of water to evaporate. As a result, the Nile reached Khartoum in a constant flow throughout the year. Here it was joined by the Blue Nile that flowed from Lake Tsana, and then by the Atbara. Both these streams flowed through the fertile valley of Ethiopia bringing a rich deposit of red alluvium, during the flood season every year. With never failing regularity the Nile at Aswan would begin to rise in June when the waters were light green in color, and would gradually increase until the middle of October, by which time the river would become a racing flood of reddish tint, owing to the silt carried by it. After October the flood receded to its lowest point once again only to repeat the cycle next June. This process had continued uninterrupted for thousands of years. The rising waters of Nile would spread all over the valley and submerge the entire area for a period of two months. After that the flood would subside and the water would drain off leaving behind the fertile silt, making the valley fit for the cultivation of crops. As soon as the engineers realized what was happening, they came to the conclusion that it was a terrible waste of having the land irrigated only once a year with so much water to spare. They turned their thoughts at once to a system of artificial irrigation by which they could hold back the excess water generated by the floods in ponds and spreading it across vast tracts of land through the canals, as and when it was needed. Systems of primitive irrigating methods had been in operation for centuries in Egypt, but there was nothing that was attempted on a large scale and naturally a start was made in the richest and most populous part of Egypt, the Nile Delta. During the early part of the eighteenth century, French engineers had commenced work on a great barrage near Cairo, where the River Nile branched into two. After working on the dam for a couple of years the work was abandoned, but the idea was again revived in 1843. This undertaking was plagued by problems from its start. Work was done hurriedly and the foundations of the barrage were unstable. In 1890, British engineers had to work at strengthening the dam before it became valuable to the people of Egypt. Said Pasha who ruled Egypt at that time is believed to have pushed hard on the work because he thought by opening the sluices of the dam he would be able to sweep away any invaders coming to Egypt from the direction of the Mediterranean. Similar barrages varying in height from thirteen to eighteen feet had been constructed earlier along the Nile at Zifteh, Isna, and Assiut. At each of these places a great canal transported water from the dam through its sluices. From there the water was transferred through smaller canals, decreasing in size and increasing in numbers into the surrounding countryside, ending in small ditches to irrigate the farmlands surrounding the Nile. Since the canals carry a large amount of water through them, it became essential to maintain a large supply of water in reserve throughout the year in barrages built across the Nile. A regular supply of water throughout the year ensured the fertility of the soil for the entire year and as a result the yield of crops went up by leaps and bounds. 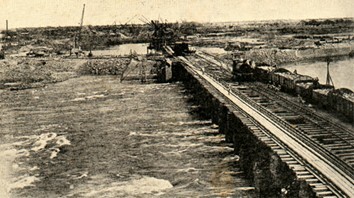 The successful function of the barrages to this end made it necessary to draw the attention of the engineers to meet the demands of water in Upper Egypt. A report was commissioned by the government to draw out an estimate as to the amount of water that was needed to irrigate all the cultivable land in both, Upper and Lower Egypt, during the period of low Nile. In the report, it was estimated that that twenty-seven million tons of water per day were required for five months of the year, in addition to the normal flow of water. In order to secure this, it would be necessary to construct a dam that was capable of holding no less than 4000 million tons of water! Of all the schemes that were proposed, the best was the construction of a dam at the town of Aswan, at a site where the Nile tumbled over a rocky slope called the First Cataract, which would be capable of holding 2500 million tons of water, and this plan was adopted. No sooner a decision was taken in this regard, a great hue and cry was raised against this proposal by the archeologists because the reservoir that would be created would submerge the prehistoric pharonic temples built on the islands of Philae for five months in a year. After careful deliberations, it was decided to lower the water levels originally proposed by twenty-five feet and this meant that the dam constructed would be capable of storing only 1000 million tons of water. When the engineers commenced their work, they had a truly tremendous task before them. The hills in the neighborhood of Aswan were made up of red granite and contained ancient quarries from which stone was taken during the construction of the Great Pyramids. And that was the only point in favor of the engineers building the dam, for this would ensure a plentiful supply of stone to the builders. During low water the River Nile ran in five different channels at the site of the dam at a very rapid pace, and right across these a dam measuring 1 < miles long had to be built at a height of 67 feet above the river level and in places 130 feet above the foundation. After the preliminary calculations, the next task for the engineers was to arrange the logistics for carrying out such a huge task. In March 1898, there sprang up such a hive of activity that had never been seen in Egypt since the ancient times when slaves of the Pharaoh dragged along the great stones for the Pyramids. Nearly a whole year was taken for the preliminaries, before a start could be made on the dam itself. During this period the services of a special staff of engineers, headed by Sir William Willcocks and Sir Mudroch Macdonald, skilled in the construction of dams were hired from England, huts and offices were erected for the workers of the dam, railway lines were laid to carry cargo to the site, and thousands of workers were taken into service, along with hundreds of skilled masons from Italy and were brought to the site. Finally, everything that was needed to begin the work on the dam was in place to start the construction. First the engineers had to find a firm bed of rock on which the massive dam could rest, and although the work on the islands between the channels was comparatively simple, the problem was how to excavate in the beds of the channels through which the water ran so swiftly. An additional complication was that no work could be carried for seven months in a year while the river was in flood. After much deliberation, it was decided that temporary dams had to be built below the site of the dam-or “sudds” as they are called in Egypt- to pump out water and free the ground for the construction of the dam. By tipping great stones over the end of the channels the engineers managed to close four of them on the downstream side during the flood season. As soon as the work could be resumed after the flood, sudds were commenced, by piling an enormous number of bags filled with granite sand across the channels. This work progressed rapidly, and when the four channels were safely cut off, pumping was commenced, which rapidly cleared the water. As soon as the channel beds were uncovered the workmen were directed to remove from the surface all the loose stones and boulders. Further excavation work had to be done before a firm base could be found. 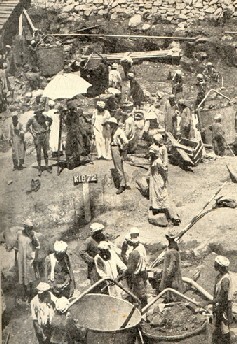 Pickaxes and dynamite were used to clear all the unsound rocks in the area. While this was proceeding, additional sudds were commenced across the remaining channel. The annual flood of the River Nile again stopped work on the dam, but not before 800,000 cubic yards of material had been cleared and the foundations for the dam was laid in all but the western channel. By the year 1901, work on the great dam was being carried round the clock and at great speed. Despite the intense heat workmen toiled relentlessly at clearing the ground and placing the stone in the heart of the dam, while the Italian masons were ready with their trowels on the other side to cement the great squared blocks. 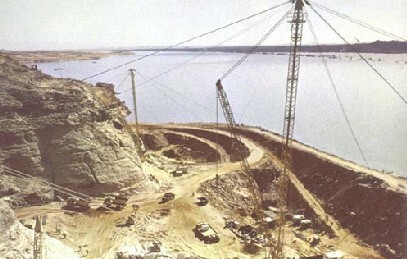 However, the construction of the dam was not easy as building a solid block of wall. Great sluice openings measuring 6 feet 6 inches wide, numbering 180 had to be left in the wall, 140 of them at a height of 23 feet and the other forty at 12 feet 6 inches. This meant that the dam had to be solid to just above the level of the riverbed, pierced by great openings for the next twenty-three feet, and solid again for the reminder of its height, except that a space had to be left for the sluice gates to move in. So rapidly did the work progress that before the flood came again the great dam had been raised to a height of nearly fifty feet above the riverbed.